This friendship can sometimes be a continuous fight for whom is more domineering, so it is essential for them to make a few compromises. The friendship between an Aries and another Aries can be either a great thing or a complete disaster. In the first case, it’s good for these two to be friends because no one else can keep up with a Ram’s energy. These natives never think twice before doing something and usually go traveling without even packing, which means another Aries can either bring more trouble or make them very happy when they’re having a strong friendship. The friendship between two Arieses is very dynamic and it involves competition because people born in this sign want to always be first and enjoy any challenge. When looking at each other, these two can easily see one another and appreciate how much independence they both need. Friendship is important for an Aries, and he or she will always be full of respect when it comes to freedom. Two of these natives are the same as far as their independence goes. However, they can also be possessive and start to argue when not feeling the other is giving enough attention to their connection. Therefore, it’s important for two Arieses in a friendship to restrain their passion and to try as much as possible to work as a team. If they succeed at doing this, they can accomplish many great things together because they’re both very energetic. Also strong characters and untamed spirits, two Arieses in a friendship will always transmit positive energies to each other and be enthusiastic about every little thing that is happening to them. They will want to try many new experiences together, but it’s possible their egos will clash because neither of them wants to let go of his or her ways in a fight, or to do things how others dictate, which also means it’s difficult for them to solve their problems. At least they’re both generous and don’t mind allowing one another to lead from time to time. The friendship between an Aries and another Aries should be watched as far as these natives’ quick tempers go and their desire to argue almost all the time. Furthermore, people born in this sign are known as very honest and eager to share their opinions, so their harsh commentaries can’t have any positive effects. However, no one can accuse them of being hypocritical or deceitful. Both ruled by Mars, the planet of war, two Arieses in a friendship will often argue and turn things into drama. They’re very protective when it comes to their freedom, so they should respect each other’s independence as much as possible. The more they’ll appreciate the fact that both have talents, the more efficiently they’ll work as friends. As said before, it’s essential for them to take turns when it comes to leading because only this way, they can become unstoppable when trying to do something together. The Aries is strong, courageous and all the time active, so he or she gets along very well with another Aries, who’s the same and never hesitates to see the best in others, to take risks for his or her loved ones and to protect the most vulnerable individuals. Two Arieses can immediately become friends because they’re both interested in connecting with intriguing characters and don’t mind being somehow helped by those who happen to be in their life at some point. Furthermore, they insist on being only best friends because they can’t stand having the second place in someone’s life. It’s possible for them to become bossy and to reveal their impulsiveness, as well as their selfishness, possessiveness and boldness when the situation doesn’t require them to. When two people who happen to be friends are also influenced by Mars, they can be regarded as two ruthless fighters. It’s possible for them to either be the perfect allies or the worst enemies. Neither of these two will ever refuse a challenge because they have a lot of passion and unmatchable energy, which also means they can enjoy great times when together. It’s only natural for them to argue with one another all the time because they’re both stubborn, but this doesn’t mean they can’t make up very fast. The friendship between an Aries and another Aries is very strong because both these natives are kind, generous and protective. When one of them is in trouble, the other doesn’t hesitate to be encouraging and to bring about his or her optimism. However, when opposed and crossed, all Arieses turn to be very childish and start to reveal their aggressiveness. It’s not unusual to see two of these individuals throwing tantrums when they’re spending too much time together. Their independence is essential for them because they both hate taking orders and want to get things done the way they know best. When criticized and told what to do, they can become very moody and make harsh remarks. It’s true all Arieses are a little bit selfish, so if they don’t pay attention to what others may feel, they can become unwanted and too spoiled. People born in this sign never hesitate to tell a lie if this brings them advantages. However, they really don’t know how to perfectly lie because others can immediately see their true intentions. Belonging to the Fire element, the Aries is full of energy, so when with another person in the same sign, he or she doesn’t worry when being dragged to different events and taking part in new adventures. These two will fight but not for too long because neither of them ever holds grudges. It’s more important for an Aries to just move on and to enjoy the next thing to do. 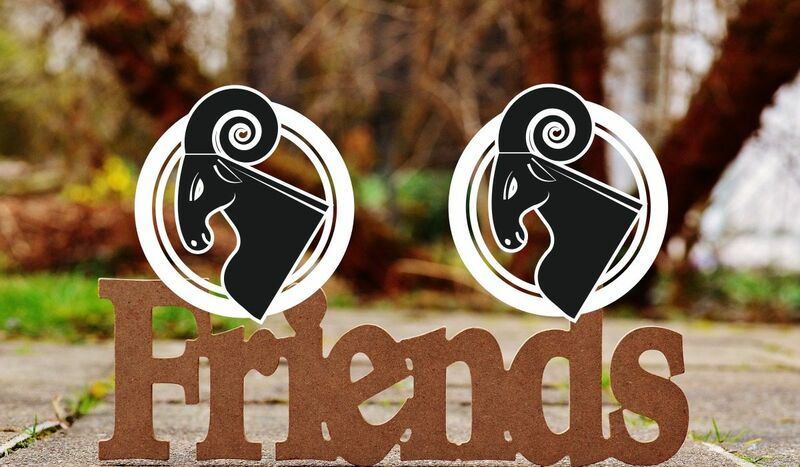 The friendship between an Aries and another Aries can sometimes be a continuous fight for whom is more domineering, so it becomes essential for them to make a few compromises when they happen to be good friends. Furthermore, they both need to keep their pride in control. The Aries is also cardinal, which means people born in this sign are good at taking the initiative and usually don’t analyze facts or consequences before jumping into a situation and investing all of their energy. Living spontaneously and trying to make things as exciting as possible, two Arieses can never get bored together, when they’re being good friends. They have too much energy and are both capable of making peace when fighting, which means their friendship is passionate and very enjoyable. The Aries is known as very loyal when he or she is friends with someone. While many can accuse a person in this sign of being selfish because he or she usually forgets about friends and family, when it comes for the Ram to respect a promise and to give a hand, expect him or her to prove his or her complete devotion. It may be difficult to understand an Aries because he or she is very independent and in the same time extremely generous with his or her loved ones. Therefore, it’s wise to never judge a person in this sign superficially or too fast. Very sociable and interested in making as many friends as possible, the Aries will get involved in many social projects and bring in his or her energy, not only as a participant, but also as a leader and initiator of things. This is one of the reasons why these natives are so wanted at any social function. Many will wonder where Arieses get their energy from, but they’ll never understand this completely because it seems to be something genetic with these people. Furthermore, they can always help others become more optimistic and happier, just by being present. Their friends are many and from different corners of the world because they can entertain anyone and their spirit is appreciated by any individual. Hating to get bored, the Aries can’t stand lazy people who don’t want to get involved in either physical or intellectual activities. Those who happen to be around an Aries should give their best to always be fascinated about new challenges and to play the ball around. Those who want to attract the attention of a person in this sign should do exciting things and be as spontaneous as possible because the Ram is truly interested in adventurous characters. People in Aries usually get upset out of nothing, so they should work more on this if they want their friendships to last for a lifetime. If they’d also become more patient, less arrogant and also less bossy, they could have happier connections with their friends. Warm and expecting only loyalty, the Ram doesn’t mind giving a hand when someone is in trouble, but he or she expects to be able to tell the truth when something goes wrong and someone makes a mistake because all Arieses are very opinionated and don’t hesitate to speak loudly about the unpleasant truth. This is a sign that can’t be mean, but more one that does things out of love and because he or she cares too much. It’s okay to be honest with an Aries because people in this sign don’t mind being told the truth.